With the 143rd Open Championship dropping in on Hoylake for only the second time in nearly half a century, there are a few among the field of 156 who’ve fond memories from 2006 worth considering outside the usual suspects. The winner eight years ago was one Tiger Woods. The iconic American proved that he was far from a spent force at the major he’s won three times previously when tying for sixth at Muirfield just last year. But that top-10 finish came before Woods succumbed to injury. Surgery on a trapped nerve in his back earlier in the spring of this year kept the former world number one off the PGA Tour between March and June. Woods marked his return to action with a missed cut at the Quicken Loans National just two weeks ago as he understandably struggled for form after such a lengthy lay-off. Although Ladbrokes’ 20/1 on the 14-time major winner may appear generous, a flutter each-way on Woods is still speculative in the circumstances. There is another American major winner taking the field whose claims are strengthened by his exploits at Hoylake last time around though and that’s Jim Furyk. 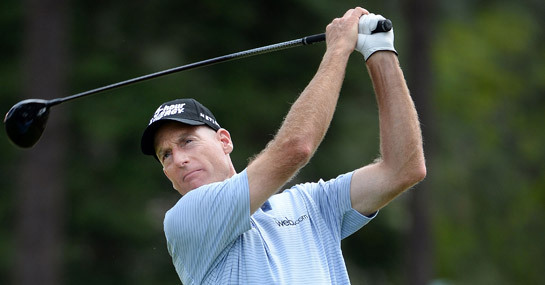 16-time PGA Tour event winner Furyk is a whopping 66/1 to claim a Claret Jug to go alongside his 2003 US Open trophy. Not only did Furyk tie for fourth at Hoylake in ’06 but he’s also recorded five previous top 10s at the British major. But it’s his consistency at all the majors – including a 12th place the recent US Open – allied with his season’s form which makes him stand out. Furyk is yet to miss a cut in 2014, while he posted back-to-back runner-up spots at the Wells Fargo and The Players Championship back in May.